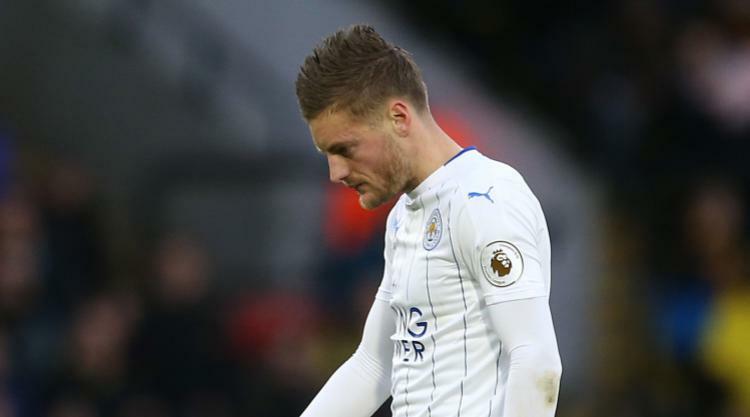 Jamie Vardy spectacularly ended his three-month goal drought with a hat-trick as Leicester inflicted more misery on Manchester City boss Pep Guardiola. The England striker, without a club goal since September 10, bagged a treble as the Foxes' early blitz inspired them to a thumping 4-2 victory over City. Vardy and Andy King scored inside five minutes, and Vardy notched again on 20 minutes before cashing in on John Stones' error for his third, with late strikes from Aleksandar Kolarov and Nolito of little significance as the Foxes moved four points clear of the Premier League drop zone. After winning his first 10 games following his summer arrival, Guardiola's City have now won just four of their last 15 matches in all competitions and slipped four points behind leaders Arsenal on Saturday evening. They face the Gunners and Liverpool before the end of the year and, having lost to Chelsea last weekend, desperately need to rediscover their form. Another mistake by Stones added to the England defender's catalogue this season and summed up City, who played into their hosts' hands. Having looked so abject in their 5-0 midweek Champions League defeat at Porto, the Foxes - showing 10 changes in personnel - tore into City with lightning speed and apparent ease. Just Wes Morgan remained from the game in Portugal as Vardy, King, Robert Huth, Riyad Mahrez and Islam Slimani returned having been rested and, within five minutes, the Foxes justified Claudio Ranieri's European selection by racing into a 2-0 lead. First it was Vardy who ended his wait for a goal with a strike straight out of last season's scrapbook. A long ball to Slimani found the forward in space and he slipped it through to his strike partner, who was hanging off the last defender. Vardy beat Kolorov to the ball and rifled an angled drive past Claudio Bravo, and King then sparked pandemonium three minutes later. Slimani was again given too much room from Huth's flick and, with his back to goal, teed up King to find the top corner from the edge of the box. Leicester returned to their roots as they looked for Vardy early and their trademark pressing, such a staple of last season, never allowed the visitors to settle. Dazed and confused, City gifted the Foxes the game with a high defensive line which allowed Vardy to make it 3-0 with just 20 minutes gone. Again, it was a move which helped bring Leicester the title last term, as Christian Fuchs looked long and early for Mahrez. The Algeria international then produced a glorious first-time touch for the onrushing Vardy to round Bravo and tap in his sixth goal of the season. There was little response from Guardiola's men, with the exception of Kolarov firing over, as Leicester's masses closed ranks. Kevin De Bruyne was at least at the heart of City's attempted recovery as he tried to drive them forward with little reward. Such was Leicester's pressing and tempo, the visitors failed to win a tackle in the opening 35 minutes - albeit they had 77 per cent of possession themselves. Their commitment to pass the ball was futile against the ravenous Foxes, and the visitors should have gone in at half time 4-0 behind but Slimani planted a free header wide from six yards. Guardiola kept faith with his side at the interval and they continued to probe as Kelechi Iheanacho missed his header and Jesus Navas' shot drifted wide. Leicester's tempo dropped as City controlled the pace and Ilkay Gundogan should have done better than to lash wide from the edge of the area after 57 minutes. Pablo Zabaleta went closer when his effort deflected wide soon after but the Foxes battened down the hatches and Manchester City never seriously tested Ron-Robert Zieler. But Leicester were gifted a fourth goal with 12 minutes left when Vardy completed the first hat-trick of his Leicester career. He seized on Stones' under-hit back-pass to round Bravo again and squeeze the ball over the line from an acute angle, despite Bacary Sagna's attempts to clear. Three minutes later Kolarov's 25-yard free-kick flew past Zieler for a consolation and Nolito added a late second when he swept in from eight yards, but there was no way back for Guardiola's men.